Twitter users are small fry as far as the Internet is concerned. In spite of mega media coverage, 19 out of every 20 people still don’t use Twitter. 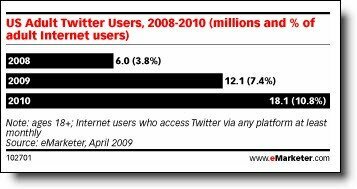 According to the latest figures collected by eMarketer, only around 3% of US Internet users are Twitter users as well. Even with all the current hype and endless column inches about Twitter – it has passed most Internet users by. And the growth predictions don’t look that good either. The past year has seen Twitter usage grow by an amazing 1,381% according to Nielsen. But even with that staggering growth it means that only one in ten people will be using Twitter by the end of next year. And these figures are based on US analyses – you can expect usage in the rest of the world to be somewhat lower. So, the question is obviously this – is it worth bothering with Twitter at all? After all, if most of your customers aren’t using Twitter why waste your time with it? Fun it may be, interesting surely, but time-wasting – possibly. With so few people actually using Twitter at the moment, many businesses could be wasting their time and money on it – or are they? In fact, the reverse is likely to be true. It’s not the numbers of people that is important – it’s the kind of people they are. According to a study of the attitudes of Twitter users they all tend to fall into a similar “type”. Most Twitter users are people who want to learn new things in a timely manner. They fit the “early adopter” profile very well indeed. However, early adopters tend to be thought leaders as well. In other words, if you use Twitter you are going to be reaching a group of people who are significantly predisposed to the uptake of your information. And people who soak up new information that’s up-to-date also tend to want to tell others about it too. They are evangelists at heart. As a result, if your business uses Twitter you are targeting a group of people who can help you spread your messages far and wide. There is no other tool available online at the moment that lets your company so easily target a group of people all of a similar psychological profile who could help you get your messages across to others. If you are not using Twitter, you are missing out on the benefit of a bunch of individuals all likely to help promote you. The fact that only 10% of people will be using Twitter in a year’s time is neither here nor there. It’s the kind of people they are – and they are people who are most likely to help promote your business. Grab hold of them…!